Writers from across the African continent converged on Nantes, France at the Alain Mabanckou powered Atlantide Literature Festival 2018 on February 15 to 18, 2018. The Atlantide Literature Festival, founded in 2013, has gathered dozens of international and French writers to the French city of Nantes. 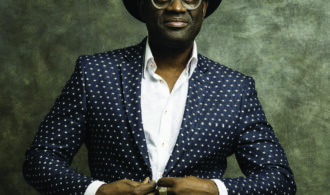 In 2018, the artistic director of the festival was Alain Mabanckou and he was the brains who picked the writers who made their way to the West of France. For four days, meetings and literary exchanges gathered in the city of Nantes, making the city, as Alain Mabanckou said, “the French capital of cultural optimism and power of the imaginary “. The novelist and essayist born in Zimbabwe and came to live in France has written the novel Chinongwa. Comorian writer and researcher has won The Senghor Prize ( International Literary Prize ), a special Mention of the Wepler Prize, The Mandela Prize for Literature 3 (International) and The Dax 1 2017 Dating Book Award for his breathtaking novel Anguille under the Rock . The novel speaks of shipwrecked unaccompanied seafarers who resonate with the many dramas of our daily news, a fierce desire to live despite enormous obstacles and a human condition throughout life. Leye Adenle is a Nigerian writer who has written a number of short stories and flash fiction pieces with the debut offering of Easy Motion Tourist which is primo grade A crime fiction. Born in the Republic of Congo, N’Sonde is the author of books like The Heart of Leopard Children (2007) which won him the Prix des cinq continents de la francophonie (Prize of the five continents of the Francophonie) 2007 and the Prix Senghor de la création littéraire (Senghor Prize for Creative Writing) 2007. He has also written The Silence of the Spirits (2010) and Concrete flower (2012). Helon Habila is a Nigerian novelist and poet, whose writing has won many prizes, including the Caine Prize in 2001. Some of his books include Prison Stories (2000), Waiting for an Angel (2004), Measuring Time (2007), Oil on Water (2010), and nonfiction offering The Chibok Girls (2017). Felwine Sarr has written books like Dahij (2009), 105 Rue Carnot (2011), and Médiations Africaines. (2012). He is the winner of the Abdoulaye Fadiga prize for research in Economics 2010 and the Grand Prix of Literary Associations 2016 (Research Category). Chinelo Okparanta is the Nigerian-American writer who has had their work feature in publications like Granta, The New Yorker, Tin House, The Kenyon Review, and The Southern Review. She is also the writer of a short story collection Happiness, Like Water (2013) and a novel Under the Udala Trees. Nii Ayikwei Parkes is a performance poet, writer, publisher and sociocultural commentator. He is the writer of Tail of the Blue Bird (which we loved) and several poetry collections. The festival opened on February 15 followed by a raft of activities involving both readers and writers. Authors got to meet their readers in the media libraries of Nantes as well as in the bookstores or the Castle of the Dukes of Brittany. There was also an official bookshop of the festival installed at the unique place proposed by the association Les Libraires Complices de Nantes. The youngest have also had their voice heard with the awarding of the Bermond-Boquié Prize for children’s literature to the writer Sébastien Gendron for his novel On the road to Indianapolis (2016). There were evenings dedicated to topics like against censorship in the Human Rights Session. There was also an art exhibition at the public library entitled, Views of migrants. By the end of the activities in the French town, a total of 11,354 readers came to the festival and 7,384 of them attended the meetings and readings. Here some images from the festival all sourced from the official Atlantitude Facebook page. Helon Habila, Chinelo Okparanta, and Leye Adenle.